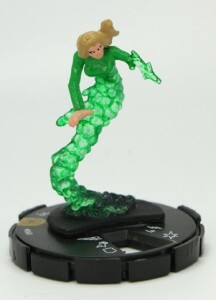 In the first two Marvel HeroClix: Web of Spider-Man features, I previewed six brand-new figs and gave you guys a glimpse into R&D’s set design process. The preview train chugs along. Choo, choo! Last post, I was a big tease, and said that I would preview a member of team NEVER done before in ‘Clix. I’ve heard some pretty creative guesses around the web, and I even jotted down a few notes for some teams to do down the road. You guys make my job pretty easy sometimes :). Before we dive head first into the preview (you can scroll down to look, if you’re not into the whole patience thing), I think I should tell you about how and why we choose full teams to plug into sets. When we debut new teams, we try to include those that link with a set (or are “on-theme”) and at least one option per set that is “off-theme.” For the purposes of sealed play, team-building, combo-creation, and most importantly, delivering on the implicit promise made by the booster pack, we need a wide swath of characters that link together and share a common comic identity. When you cracked open a Hammer of Thor booster, it was important to us to deliver the Thor-experience. Conveniently, many connections in the comic universe are pretty fibrous, so being on-theme and having off-theme options can sometimes blend together. Take last week’s example of Norman Osborn, he debuted as the Green Goblin, but his range of theme-appropriateness has mushroomed out considerably over the past decade. That being said, having one team (or set of related characters) per set standing alone provides some unique options. 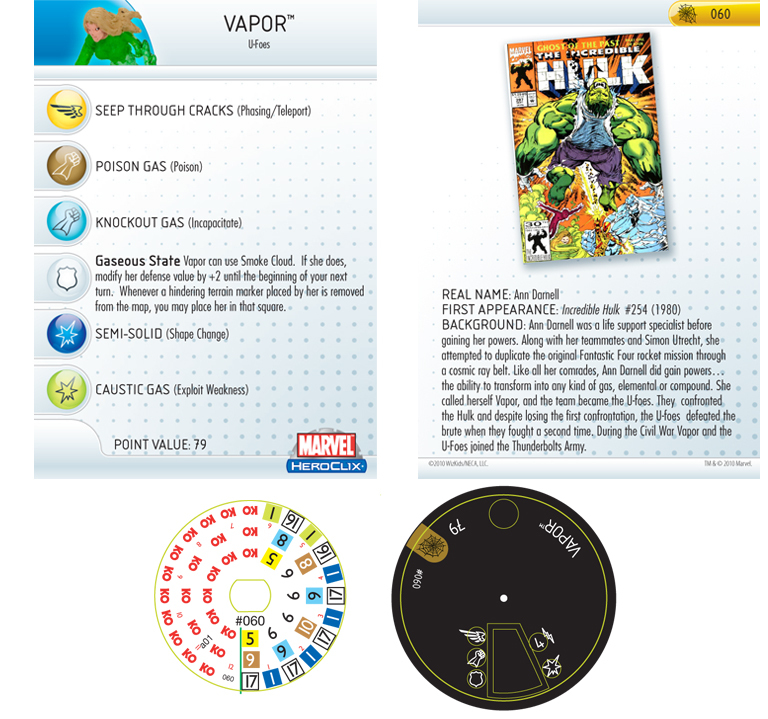 Suppose that you’re not a giant Thor fan, but that you are a huge HeroClix fan? Hammer of Thor included a few teams that were off-theme that provided non-Thor fans with characters that they love, just in case you didn’t know your Mjolnir from a hole in ground. In HoT, The Runaways provided just such an appropriate subtheme. HoT was full of “godly” high-point figures that fire lightning bolts, lead armies into battle, and individually stand toe-to-toe with street-level squads. Mechanically, The Runaways were nice, low-point options that smoothed Sealed Play and gave team-building alternatives. In terms of their comic sensibility, the Runaways are also far different than the Thor characters. Most Thor-themed figs date back to the ‘60s or ‘70s, while the Runaways are relatively brand-new. The Thor characters are for the most part grim and serious, battling at the inter-dimensional and cosmic level. While the Runaways story is far-reaching, the characters are much more human. They are angst-ridden youths that are stumbling through adolescence as well as coming to grips with their super-heroic natures. They were the perfect Thor-foil, and R&D fell in love with the Runaways in HoT. We’re including all four members of the U-Foes in Web. Additionally, I can give you the exclusive tip that we’re putting one U-Foe member at each rarity. As a four person team, the U-Foes split up neatly, and their range and uniqueness of powers is extremely compelling. Today, we have a look at the set’s Super Rare U-Foe, Vapor. A slippery, yet dangerous adversary, Vapor (pardon the pun) is hard to pin down. An interesting character to design, Vapor can shift forms between different solid-and-gaseous states. Mechanically, each member of the U-Foes provides a different tool to the force, much like a party in a RPG. Vapor is a unique tie-up piece that sneakily can pour on extra damage via Poison and Exploit Weakness. While a character like Ironclad can tank for the force, Vapor is maneuverable (Phasing/Teleport) and if not dealt with early, can be a real hassle. Don’t “Runaway,” because next time, we’ll be looking at the man, himself. It’s Spider-Man time! P.S. For those that got accustomed to drinking from the preview firehose, expect to see the remaining U-Foes and some other characters slip out through other preview channels (Facebook, Twitter, and more). That’s right, you have to friend us and inadvertently learn about our favorite ice cream flavors.